يحظى فندق فندق دبل تري باي هيلتون، إسبالاندي داروين بمكان متميز في محور داروين مطاعم, سياحة, ثقافة في منطقة دارون سيتي الفاتنة. يمكن من هنا للضيوف الاستمتاع بسهولة الوصول إلى كل ما تقدمه هذه المدينة النابضة بالحياة. إن سهولة الوصول من الفندق إلى المعالم السياحية الشهيرة الكثيرة في المدينة كمثل دارون سيتي سينما, بيسنتينيال, Read Back Book Exchange هو استثنائي بحد ذاته. إن حسن الضيافة والخدمات الراقية التي تعرف بها Hilton Worldwide تغني تجربتك في فندق دبل تري باي هيلتون، إسبالاندي داروين. يمكن لضيوف الفندق الاستمتاع بالميزات التالية على أرض الفندق: خدمة الغرف على مدار الساعة, مكتب الاستقبال على مدار الساعة, تسجيل وصول/خروج سريع, واي فاي في المناطق العامة, صف السيارات . بالإضافة لهذا,تتضمن كل غرف الضيوف مجموعة واسعة من وسائل الراحة . بعض الغرف توفر حتى تلفزيون بشاشة مسطحة, غرفة معيشة منفصلة, اتصال لاسلكي بالإنترنت, اتصال لاسلكي بشبكة الإنترنت (مجاني), غرف لغير المدخنين لإرضاء أكثر الضيوف تطلباً. يمكنك طلب اللائحة الكاملة للخدمات في الفندق ومن بينها مركز للياقة البدنية, حمام سباحة خارجي. استمتع بخدمات لا يعلى عليها وعنوان ذو اعتبار في فندق دبل تري باي هيلتون، إسبالاندي داروين . Had an amazing stay. The rooms where spacious and the beds were comfortable. Staff was amazing, and the cleanliness of the hotel was top notch. We picked up a great deal through insider deals so well below normal price. the room was nice, however water views are limited. Pool was lovely and the staff were super friendly and very efficient. We only had breakfast at the restaurant which was typical buffet style, but quite enjoyable. Great location, easy walking distance to Mitchell street. Large bright room, great pool and terrific staff. Could not fault the standard of the hotel especially considering it is in Darwin. The one draw back is that the water is controlled by pressure pumps so the hot water varies from hot to cold during a shower. During the night we were constantly aware and woken by the pressure pump kicking in and out as the water pressure would rise and fall. Maybe it was only a maintenance problem? our room was spacious and clean, however the ensuite and shower was a bit dated and could benefit from a little maintenance but not a major problem. the outdoor pool area is really nice but could also benefit from more sun beds as there was never really enought to go around. poolside food was of a high standard as was breakfast. Great location, free parking, good facilities. We had two stays of two nights each in Jan/Feb 2015. Staff were helpful and confirmed tour bookings. Free parking under hotel. Well equipped laundry on site. I've stayed in almost every hotel in Darwin, many are unremarkable, some just terrible, however this hotel has really made an impression. The reception staff were fantastic, I'd messed up my booking & they were great at sorting it. I had a friend arriving, they took fantastic care of her, the rooms are really generous, there's free parking and you're right on the Esplanade which is beautiful. I've just booked another stay for this week & I can't wait to get back. The only thing that would make a huge difference for me is free wifi - I just don't understand why all the hotels in Darwin charge for wifi - it's so draconian in this day & age! A great Hotel in an excellent location. Two small things however, the emergency torch in our room was not working due to corroded batteries suggesting no maintenance on it and our TV remote was flat also. The TV rception was also poor. The TV also could be larger considering this is a Hilton. Very friendly staff and great facilities we enjoyed our two night stay. thankyou. We loved this hotel. We did not care for Darwin very much--we got ambushed by a cyclone and stuck in Darwin--so when we checked into the DoubleTree we were so relieved. In a downtown that is extremely loud, we were able to find solitude. The room was immaculate, it had a full-sized bath tub (I soaked for a while!, )a variety of cable channels (we were stuck indoors), and the bed was so comfortable. It was the only hotel we slept well in. I've been to other Double Trees, and they are always good, but the staff here truly deserves compliments! They were friendly, efficient, and went out of their way to assist us whenever we needed it. Thanks so much for a great stay. We stayed here early November, so it was off-season and the hotel was not busy. Reception staff were friendly and attentive, as were the pool bar staff. Rooms were comfortable. Underground parking was free. The hotel is well positioned on the Esplanade, with Mitchell St behind it, and the waterfront a fifteen minute walk away. So everywhere is in walking distance, during the day or in the evening for the bars and restaurants. Would recommend this as a base for visits to local attractions as far afield as Litchfield Park. The hotel was clean and the rooms were ok. Peak season in Darwin, the hotels are very over priced and I got a reasonable price at this hotel, although still three times what I had payed previously. I decided to use the wired internet option and payed $30 for 24 hours. After my first 10 minute browsing session, I logged in again and was given an option to continue on a slower speed or pay more money for faster internet. I chose not to pay more money as I thought this to be quite ridiculous as I had already payed for "high speed internet" This took me back to slower than dial up speed so I took the faster option in the end. On checkout, my internet bill was $150. If I spent all night downloading movies, then maybe I could wear it. I did use it for a few hours, but only browsing. I won't be staying at Double Tree again. We had a wonderful stay at the Double Tree. The staff were fantastic, attentive and helpful at all times. Rooms were clean and room service was fast, anything you need..no problem! Beautiful pool area with lunch and cocktails served for you by the pool. Breakfast buffet fantastic and good coffee available for order, the cook will do your eggs however you like too! Airport shuttle booked and on time for our departure. I highly recommend this hotel and look forward to staying there again on our next trip to Darwin. Very attractive, well-furnished room, comfortable bed, complimentary cookies. Unfortunately we only had one night available to stay in Darwin. Then our stay we even shorter than we had expected because the Ghan train was delayed on its trip up from Katherine and so did not arrive in Darwin until 9 p.m. This meant we had to go straight to bed. Next morning we had to be up at 6 a.m. in order to get back onto the Ghan for the return trip to Adelaide. So we did not have the full benefit of all the hotel's facilities. We did appreciate the helpfulness of the staff members and we enjoyed our cooked breakfast in the morning very much. So we are sorry we cannot give you much of a review but our experience was very positive. The only thing I missed was free wi fi in room. THere was a limit on wi fi and that was only available in lobby.I prefer to be relaxed in my room doing what I have to do on my smart phone and not have to go to the lobby for little things like that. The weekend that we stayed at this hotel was the weekend of the Darwin V8 supercars - so everywhere was charging a ridiculous price for room rental. We paid over $200 for this room on the particular night that we stayed which was an absolute disgrace. The room was very outdated and definitely requires a makeover and modernisation. They have spent a lot of money when the rooms were first fitted as everything is of good quality....just out dated. The staff are friendly, and its in a great spot within the Darwin CBD. We only decided to stay here because we were between a rock and a hardplace. Overpriced. 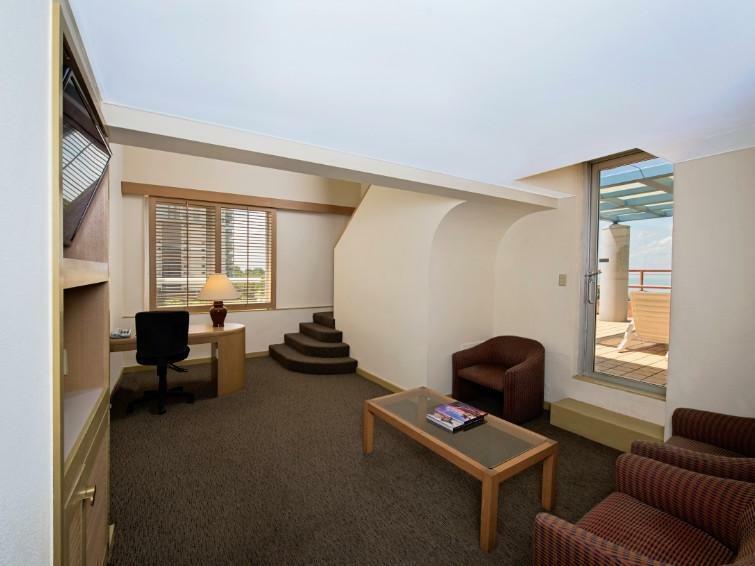 This hotel is well-located on the street overlooking the Esplanade park and Darwin Harbour. It is a short walk to the downtown area and has a good Indian restaurant in the hotel complex. The staff were helpful and friendly. The pool is attractively located on the terrace, near the breakfast dining room. Colonial shutters in the rooms give a relaxed atmosphere of the tropics. Stayed at this great hotel for a family wedding. Rooms were a good size. Very clean and extremley comfortable. Wedding reception was held in one of their many confrence rooms. It was beautifuly presented with some of the best food Ive eaten plus beautiful decor. Hotel is walking distance to all the action in Darwin city and represented great value for money. Cant wait to go back again. Was so impressed, I joined thier club. this is my 3rd stay at this hotel and it was as good as the 1st. from check in to check out, all was excellent. no complaints at all. for the price you will find it very hard to beat this hotel. no need to search for anything else. will always stay here when in darwin.